With all the talk these days about the CPP being improved to provide greater benefits, many are wondering whether they should postpone taking their CPP until age 70 rather than the usual age 65. As usual, the answer is not clear and depends largely on your unique financial situation. Since delaying taking your CPP until you turn 70 will increase your benefits by as much as 42% (0.7 %/month x 60 months) it sounds like a pretty good idea. However, if you don’t have the income to support your lifestyle during those 5 years, then you will be drawing on your investments or income assets which might result in an overall worse situation.. The other factor which comes into play is your health. 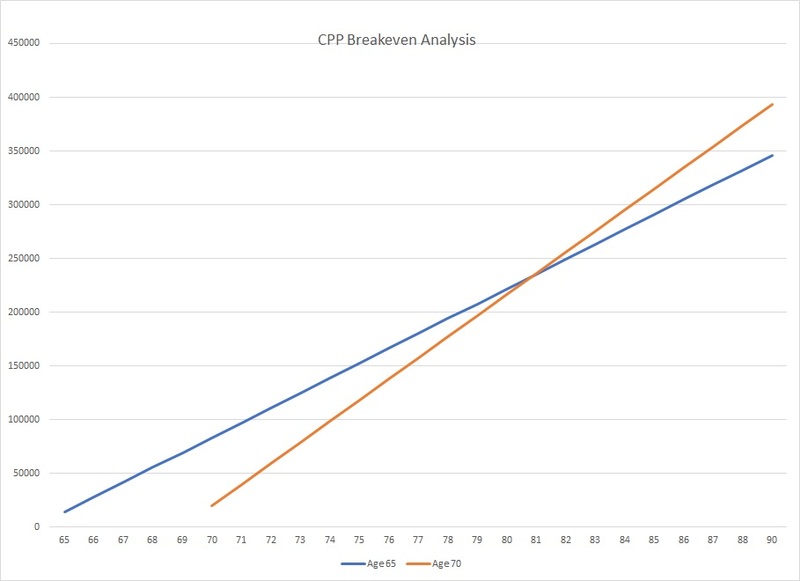 As the chart below shows, the breakeven point for delaying taking the benefits is approximately age 81. So if you’re confident that you will live longer than that, then the cumulative benefit of delaying your pension is greater. However, if your health is not so good and the possibility of you living beyond 81 is low, then you may want to take the benefits now, while you can…since you can’t pass them on to someone else. This is where good, flexible financial planning software becomes invaluable. 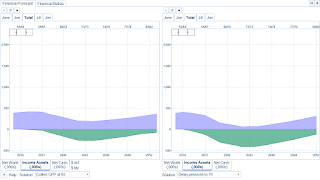 Let’s look at a scenario using Vision Works Life Planning software which I use in my practice. Our sample clients are Jane and Joe Workman (fictional clients) who are in their late 40’s and plan to retire when Joe turns 65. Let’s compare the two scenario’s of taking CPP and delaying CPP. 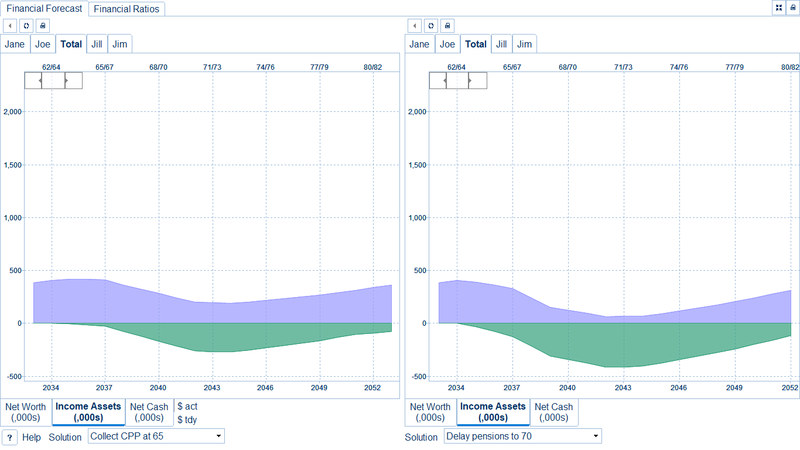 You can quickly see that delaying their CPP to age 70 dramatically reduces their Income Assets to the point where they would be at risk if a major expense were to arise in the period until their assets had built back up again (late 70’s). So the point is, you can’t just make a decision based on assumptions that don’t factor in all your financial data. It’s always better to work from a flexible model that can simulate your unique situation. Only then can you make a truly informed decision. Next: Next post: What are you working for, anyway? posts more, “pop”! Your content is excellent but with images and video clips, this blog could certainly be one of the very best in its field.